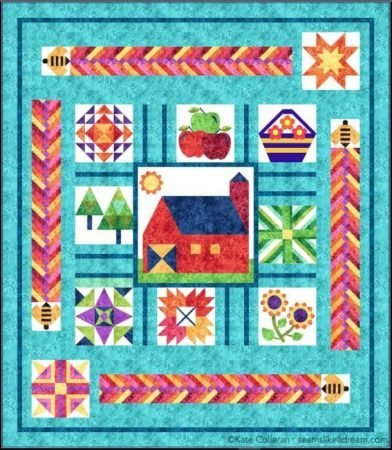 A new 12 block, Block of the Month pattern. Great for newer quilters - lots of techniques to learn with big blocks. Includes Applique and pieced apples, flowers and baskets. Pieced stars, applique bumble bee, pieced barn, pieced schoolhouse, applique sunflowers, pieced bear paw, pieced trees. Includes instructions for basick paper piecing and paper templates for applique. Also includes ruler and angle paper templates.